Several facial rejuvenation “trends” have become popular among women and men in their late 30s and 40s who want “improvement” in their cheeks, jowls, neck, and jawline but are not yet ready for a “real” facelift. These are often referred to “lunchtime” treatments and procedures, as many can be performed during a patient’s lunchbreak from work or other daily activities. The “liquid facelift” rose to popularity a number of years ago and centered around adding filler—especially long-acting and volumizing fillers such as RADIESSE® and JUVÉDERM VOLUMA™—to the areas of the face that tend to “lose volume” with aging. This approach follows the concept of “filling a balloon” in that adding volume to specific areas will impart some “lift” to the face. In my opinion, this works best along the jawline (especially for men who desire jawline improvement), but it is not ideal in other regions. I see so many women who have been “over-plumped” elsewhere prior to coming to me. Just like placing a bigger breast implant does not ever “lift the breast” like a mastopexy would, adding more filler doesn’t provide more lift either—it only makes the face fuller. Now, I believe we can do better…and with less. 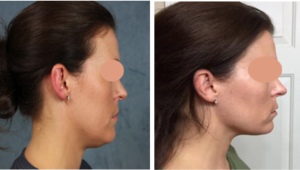 I was admittedly a sceptic when KYBELLA® launched, but as a board-certified plastic surgeon in practice for 12 years, I was blown away by the dramatic improvement KYBELLA® provided for individuals seeking to reduce the appearance of a “double chin.” The image below features a patient several weeks after just one, 20-minute treatment KYBELLA®. All of us are “looking down” more now as we take selfies and spend more time on our phones, and it shows us that angle we don’t like to see. Now there is a fix that doesn’t involve surgery when this gets started—KYBELLA® can “dissolve” that pocket of fat underneath the chin, and from what I’ve witnessed with my patients, even tighten the skin a bit. For patients who have midfacial volume loss in addition to some “early jowling” (when we “pick up our cheeks” and wish for a little bit more), we now have the Silhouette InstaLift™. This is a 20-minute, in-office procedure that requires no stitches or incisions, and it actually lifts the cheeks, corners of the mouth, and jowls. The InstaLift™ involves the subdermal placement of dissolvable “sutures” that have cones (or bumps) on them combined with “spot” administration of a local anesthetic. Once placed under the skin on each cheek, the sutures lift the soft tissue of the (cheek) face for a rejuvenated appearance. Best of all, in 30 days, the suture is gone but the lift stays, and new collagen is formed which gives some added benefit of surface improvements to the skin. This is a step beyond what type of “lift” can be obtained with injectable fillers, but this is far less extensive/invasive than a traditional facelift or even mini-lift. In fact, the majority of individuals don’t require any pain medicine or downtime, and the most noticeable side-effects I’ve witnessed in my patients are minor bruises similar to what occurs after filler treatments. Lastly, for those that want a neck lift and aren’t ready for the full neck lift, the ICLED neck lift is often an excellent solution that can be done in the office with local anesthesia. This innovative technique is a way to lift the neck using a woven suture placed under the skin with a light-guided device, allowing the procedure to be performed in-office. There is very little recovery time, and the results have been outstanding. For more information about any of these minimally invasive facial rejuvenation options, or if you are interested in scheduling a consultation to find out what treatment(s) may be right for you, please do not hesitate to contact my practice today at 713-800-6060.